I am Zinniacom*. Hear me Roar. And, not just roar. O, no. I cry. I laugh. I flip the bird. I smirk. I touch your readers gently in those nether regions where your language fails to go. 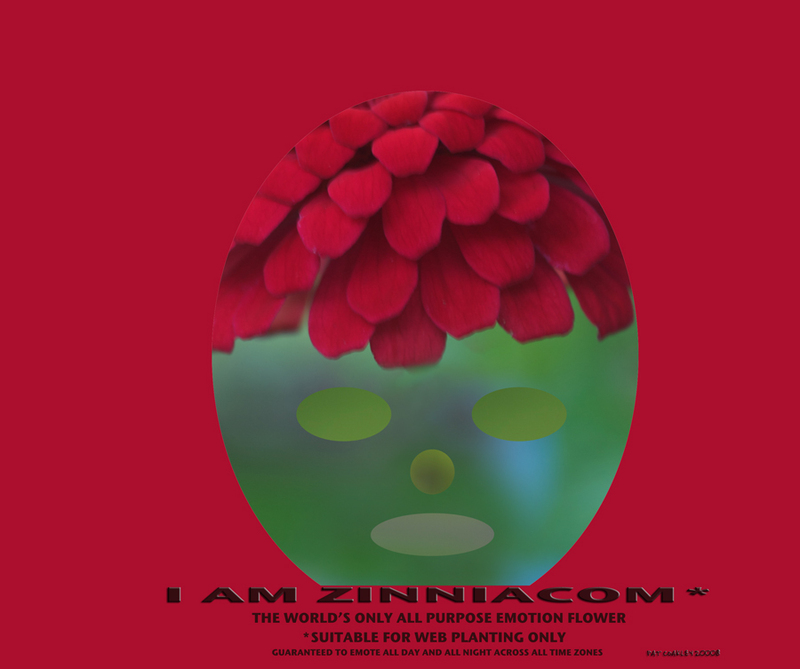 Yes, webmen, I am Zinniacom–the world’s only all purpose emotion flower. Tired of those ol’ yellow smiling, wiggling winking jittery frowning thingamajigs? Yes, THOSE yellow disks that others have called “the yellow abominations”? Worried about communicating with people? Fretful that the inner you is not visible? Need some insurance that you haven’t just miscommunicated with your boss? Tired of offending prospective loves of your life with that lowly text only “tongue hanging out” emotiocon: :-P? Concerned in your on-line dating sites that when you are just being a dork, someone might think you really are a dork? Fear not. Zinniacom emotes the inner you, (that “inner you” you always wanted to be but in real life? But, hey! That’s none of my business) Yes, as I was saying, Zinniacom emotes the inner you 24/7, all day, all night, across all time zones. Madame Hysterical- you better RUN to the copyright/patent office right now and grab this as rightly yours. How many ” Oh My Gods, Oh My Gods,” can I screech from my desk and ask how one mind can come up with this stuff? Cheeseman is going to try to grab this, you know. I think you’ve done it now, Ollie. Dagnabbit but how do I get one!???? You are a singular coffee table book waiting to be published and I beseech you to claim this image as yours. You’re like the good wizard behind the curtain but your the Wizard of Ours!!!!! I hope that your new emoticom is “actual size shone” anything less would make me…make..I would,,,help I need one now!!! I think that emoticons are a symptom of mass group intellectual laziness. It would seem that people can’t take the time to think about what they are reading and they need to have every emotional nuance spelled out for them or they won’t understand the motivation and intent of what’s being said to them. We can see the same thing in movies. Endless and needless denouement for the morons in the audience. When it comes to punctuation in general though, I would like to see the interrobang come into general usage. BL: Wouldn’t that be something? The woman who hates emoticons registers one with the copyright office?? Tipota: If you ate a potato that looks like my spud, you are in the hospital as I write this. Designer spuds are poisonous. Nkgee: Ummm….I’ll have to call you and see whether you are alright. Razz: I just had to look up “Interrobang”…had never heard of it. Now that I know, I totally agree. It’s a question mark and exclamation mark combined, people. I’ve never seen it even discussed. I have to get out more. Razz, Pat- I thought ” interrobang ” is what the government does at Guantanamo. The PRISONERS have to get out more. Razz, I agree with your point about lazy readers, couch spuds ( sorry Pat ), and communal mental sloth..
That’s why I come to these pages. You included one of these with my card, right? Right?! Hooraaaaaaaaaaaaaaaaaaaaaaaay! We have Zinniacom. We have an online emoti-fleur. We also have SPUD IN LONDON!!!! He arrived today, and I have to say he is on my mantlepiece already. People, I cannot say how I love Spud and how I’m so thrilled that Pat decided to send him to me for a holiday in grey old London Summer. At least he came fully equipped with sunglasses and beach chair. Good old Spud. Frame coming soon. Pat, I love the flower but more importantly for the moment THANK YOU THANK YOU THANK YOU THANK YOU THANK YOU THANK YOU for my greeting card of Spud. Also – great quality. Who printed them for you? They look and feel great. ” What’s the Friggin’ Point ” card today too. How totally fab is it to get the gift of your talents, in an envelope, with your personal touch. And now I have your return address too…! Thank you- it’s staying on my desk in my studio. Well, happy to hear the cards have landed! I had four more delivered today. I’ve had a total of 17 printed in all. What exactly I am going to do with all of them, I do not yet know. I use the Apple card services through IPHOTO. I like the quality and the choices. I am going to submit tanning spud to that photography contest on potatoes. Although, I know full well they’ll think I’ve lost my mind. But, I’ve got it in my head that they’ll be looking at all these serious photos of the potato industry and all of sudden Mr. Spud shall appear, chillin’ out and they’ll all laugh and hire me to do my “Failure: The World Tour” promoting the potato as not just your dinner but your dinner’s entertainment, too! “Interrobang” according to BL sounds like something you’d hear on MSNBC! It does fit, doesn’t it? Sadly it fits.